On P7S-441, SG-1 is under attack by Jaffa. Tyler has been wounded, and O'Neill has gone back for him. Now the two are pinned down, and Carter, Daniel, and Teal'c are ordered to return through the gate to bring reinforcements. Arriving at the SGC, they urgently request a rescue mission for O'Neill and Tyler, until Hammond insists that no Lieutenant Tyler exists. No one can explain why only SG-1 seems to be aware of Lieutenant Tyler, but Carter, Daniel, and Teal'c are confined to the infirmary for evaluation, while O'Neill remains trapped on the planet with a teammate who may not exist. 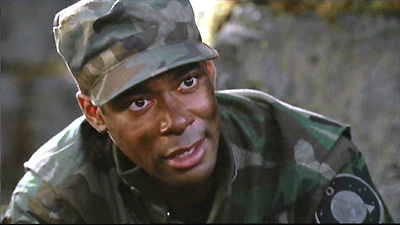 As Hammond organizes an aerial search of the planet by UAV, and Carter begins a search of her own through the base computers, Colonel Simmons returns from the Pentagon with orders to conduct an investigation into the possible security compromise of SG-1. Daniel, Teal'c, and Carter are each brought before Simmons for interrogation, but the sessions prove fruitless. It is Dr. Fraiser who discovers an important clue in a residue found on Teal'c's jacket. As she touches it, she too begins to remember Lieutenant Tyler, and her analysis suggests that Tyler is simply an anomaly, the result of a chemical suggestion. On the planet, as the Jaffa close in, Tyler confesses to O'Neill his true nature. He is Reol, a race that uses a chemical defense mechanism which causes a sense of familiarity, and which is sought by the Goa'uld. The confession no longer matters, however, as O'Neill and Tyler engage the Jaffa in battle side by side, just as SG-1 returns with support. Tyler tries to surrender to the Jaffa to provide SG-1 with a means of escape, but SG-1 does not leave their people behind. A final ambush of the Jaffa rescues Tyler, and allows safe access to the gate, and home. The Reol are a race that does not embrace technology or conflict. Their natural defense mechanism is a chemical produced in their bodies which resembles cortical acetylcholine, a neurotransmitter that helps regulate and process human memory. It is spread through close proximity, and dissipates fairly quickly. It affects the temporal lobe associated with face recognition, allowing the mind to fill in the details to produce a sense of recognition and familiarity. Kaiael had been captured by the Goa'uld for study, had managed to escape, and their transport crashed on P7S-441. He used the chemical on SG-1, and the "Made in Tyler, Texas" label on an MRE to induce their memory of him as Lieutenant Tyler, from Texas, who had been assigned to SG-1 last month for training, and had completed three missions with them. The Goa'uld have hunted the Reol for study, nearly to extinction. A group of them have started a new colony on a planet in an isolated part of the galaxy. Colonel Simmons has ties to the Pentagon, but his chain of command is unclear, and his superiors unknown. He had accessed secure files from the SGC, logging in as "User 4574". Jack O'Neill was born in Chicago, and raised in Minnesota.